New York-based firm Jac. 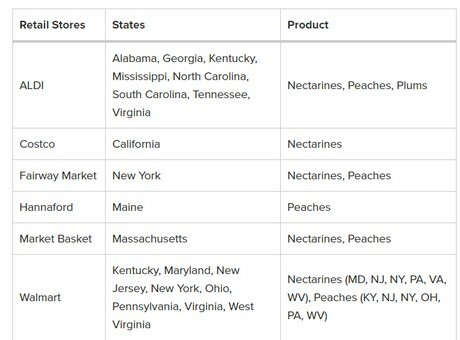 Vandenberg Inc. has recalled 1,727 cartons of fresh peaches, 1,207 cartons of fresh nectarines and 365 cartons of fresh plums that were being sold to the public by such major retailers as Costco and Walmart. The imported fruit may be contaminated with Listeria monocytogenes. The peaches, nectarines, and plums sold at ALDI are packaged in a 2-pound bag with the brand Rio Duero, EAN# 7804650090281, 7804650090298, 7804650090304. The nectarines sold at Costco are packaged in a 4-pound plastic clamshell with the brand Rio Duero, EAN# 7804650090212. According to foodsafetynews.com, no illnesses have been reported to date in connection with the recalled fruit.